Key accused in the lynching case Vishal Singh Rana, the son of local BJP party worker Sanjay Rana, and Puneet were among those in the crowd. Vishal claimed that 16 of the 19 accused were part of the audience. With the accused in the 2015 lynching of Mohammad Akhlaq on the suspicion of possession of beef sitting in the front row, Uttar Pradesh Chief Minister Yogi Adityanath invoked the incident at a rally in his village Bisara in Greater Noida on Sunday. “Who doesn’t remember what happened in Bisara? The way the Samajwadi Party government tried to curb our emotions here,” said Adityanath, while campaigning for the BJP’s Gautam Buddha Nagar candidate, Mahesh Sharma. Vishal had been charged under IPC Sections 302 (murder) and 307 (attempt to murder), among others. However, the charges are yet to be framed, with the case pending in a fast-track court. The next date for hearing is April 10. Puneet was not named in the FIR but was arrested three months later on the basis of Akhlaq’s daughter Shaista’s statement. While all the accused are back home at Bisara, Akhlaq’s family had left the village shortly after the incident. The CM also accused the previous governments of “harassing” the majority community by lodging “false” cases against them and thus creating a “breeding ground” for riots. “During my two years, has there has been any Bisara-like incident? Has there been any safety concern to sisters and mothers? No. This cannot happen because we have said that we will guarantee safety and development to 23 crore citizens of the state, bring everyone into the mainstream. We won’t differentiate between people but won’t engage in appeasement politics,” he said. In another speech in Ghaziabad, Adityanath hit out at the Opposition for seeking evidence of the airstrike in Balakot, claiming only two factions were “pained” by the post-Pulwama retaliation — Pakistan and the Opposition. 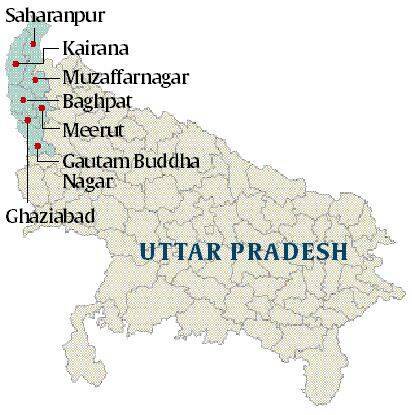 Both Ghaziabad, from where Union minister V K Singh is contesting, and Gautam Buddha Nagar go to polls on April 11. The Akhlaq lynching case was handed over to a fast-track court in April 2016 after a charge-sheet was submitted in December 2015. The FIR, registered at the Jarcha Police Station, was filed under Sections 302 (murder), 307 (attempt to murder),147 (rioting), 148 (rioting with deadly weapon), 149 (unlawful assembly), 323, 504 (intentional insult to disturb peace) among others. A Surajpur Court in 2016 had ordered a separate FIR to be filed against the family members of Akhlaq for alleged cow-slaughter. “The matter is pending investigation. Various facts are being examined and no arrests have been made,” said K K Rana, SHO, Jarcha. Incidentally, the Chief Veterinary Officer of UP had submitted a report saying the meat sample recovered from Akhlaq’s house was of “goat progeny” and not beef. With charges yet to be framed and all the 19 accused on bail, Akhlaq’s family questioned the functioning of the fast-track court. “It’s been so many years, we have had dates after dates. We keep doing our duty by visiting the Greater Noida court, but we are still awaiting trial. The fast-track court was set up for a purpose and it remains unfulfilled. The accused are roaming free with zero consequences,” Akhlaq’s brother Jan Mohammad said.